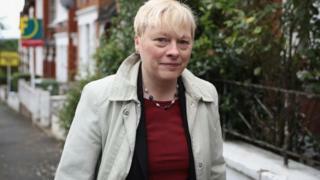 Angela Eagle has said she will announce her bid for the leadership of the Labour Party on Monday. Ms Eagle, who resigned as shadow business secretary last week, said leader Jeremy Corbyn had failed "to lead an organised and effective" party. Mr Corbyn's spokesman insisted he would remain as Labour leader and would fight any leadership challenge. It comes after Labour's deputy leader Tom Watson called off talks with unions aimed at resolving the stand-off. Unite's general secretary Len McCluskey, who had been leading union efforts, said Mr Watson's actions were an "act of sabotage", and hinted at a possible split in the party. Mr Corbyn has refused to step down despite a vote of no confidence passed by the party's MPs last month - and many resignations from his shadow cabinet - in the wake of the EU referendum. Confirming her leadership bid, Ms Eagle said she would "explain my vision for the country and the difference a strong Labour Party can make" on Monday. 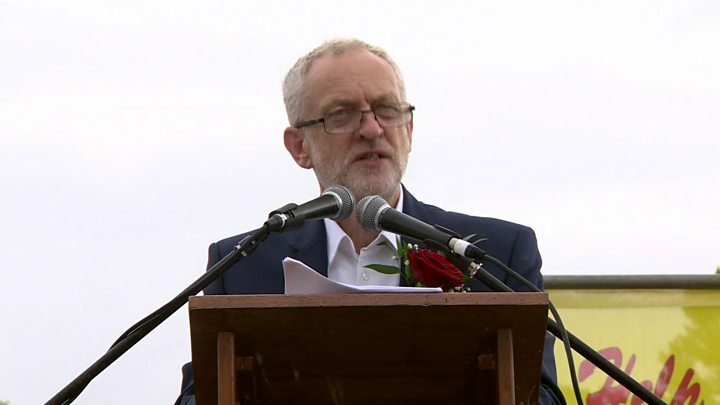 But Mr Corbyn, in a speech at the Durham Miners' Gala, urged the party to unite. "I urge all my colleagues to listen very carefully to [the unions] and indeed come together to oppose what this government is doing to the most vulnerable within our society," he said. Media captionJeremy Corbyn: "There is no pressure on me"
He did not directly comment on the potential leadership challenge, but hinted his resolve would not be broken, saying his patience was "infinite". He added that he had been asked how he was coping with the pressure on him, and had replied "there is no pressure on me". "The real pressure is when you don't have enough money to feed your kids, when you don't have a roof over your head, when you're wondering if you're going to be cared for," he said. Calling off the union talks, Mr Watson said Mr Corbyn's declaration to continue "come what may" meant there was "no realistic prospect of reaching a compromise" over the leadership. The Unite union - the UK's biggest union - had been due to meet representatives of Mr Corbyn and Labour MPs in Brighton on Sunday in a bid to break the deadlock. Mr Watson said he had made "significant progress" during initial talks this week, adding it was his "strong belief" the discussions could have led to a basis for further talks. But he said: "It is with regret and profound sadness that I have concluded there is little to be achieved by pursuing wider conversations with our union affiliates at this time." Mr Corbyn's spokesman said it was "disappointing that some have walked away from [the talks]". Unite's general secretary Mr McCluskey, who had been spearheading efforts to resolve the leadership crisis, said Mr Watson's actions were an "act of sabotage fraught with peril for the future of the party". He said he had made it "absolutely clear from the outset of these discussions that Jeremy Corbyn's resignation as leader was not on the agenda", and to suggest otherwise was a "deeply disingenuous manoeuvre". BBC political correspondent Iain Watson said: "He [Mr McCluskey] wasn't trying to force him out tomorrow, but ideas about Mr Corbyn's longevity and whether he could stand aside in 2018 were certainly being discussed." But with Mr Corbyn looking determined not to be moved, deputy leader Mr Watson cut off communication, our correspondent said, adding: "It seems Mr McCluskey felt he was not given adequate notice - and we had the strong statement from him calling it an act of 'sabotage'." "So yes, we are talking about a leadership challenge against Jeremy Corbyn [from Angela Eagle]. But we could be talking about something even bigger - a possible split in the Labour party," he added. Earlier, shadow home secretary Andy Burnham said the party's priority now "should not be to descend into civil war". "It should be to give the country some clarity and stability and get after this government because it's causing chaos," he said. Shadow work and pensions secretary Owen Smith, who had been named by some as another possible leadership challenger, issued a statement saying he was "committed" to preventing a split. He said division was the "greatest crisis facing Labour in generations", adding that "a small number of people from both the left and right of our party seem intent on letting it split". Mr Smith intended to meet Mr Corbyn for discussions later this week, BBC political correspondent Iain Watson said.